From 11 to 18 May 2019, ICS will run Tech Week, a week-long, nationwide festival on everything to do with technology. We are looking for people to run events for people in their local community, or even at home with their own children, in support of the festival's objectives to increase the level of interest and awareness in technology and STEM subjects. Find out more below. -	To educate all citizens – of every age group and background – about the challenges and rewards of our fast-changing technological society. 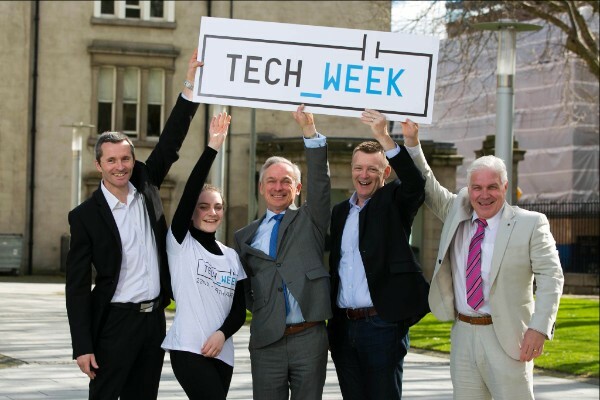 Tech Week is made up of ICS-run (Scratch and Bebras) and community activities taking place across Ireland – in libraries, schools, community centres, and many other locations. These projects give students a chance to develop their interest in STEM subjects, examine potential career prospects, learn new skills, be creative and, most importantly, have a lot of fun. The festival is a huge success, with tens of thousands of people participating in activities in previous years. Activities at home can be run by using one of our Tech Week activity sheets. These contain all kinds of interesting activities and exercises you can complete together. Our National Scratch Finals will also be running during Tech Week. Scratch is a visual programming language that makes it easy for young people to create their own interactive stories, animations, games, music, and art – and share their creations on the web. We are offering Scratch primary school lesson plans as resources for activities. You can register for these on the Scratch site. The Bebras® Computing Challenge introduces computational thinking to students from 8 to 18, by allowing them to solve interactive tasks online. This could be used as a fun challenge both in or out of the home. The top scoring students in each category are invited to attend the Bebras National Final which will be held during Tech Week in Maynooth University on Saturday 11 May 2019. Why not try the Bebras Challenge as to see what it’s all about! Visit the Bebras website for more information. Communities have been highly creative when designing activities, and we encourage you to do the same – as long as it meets the objectives of the festival and encourages young people to actively engage with and learn about technology. We are currently in the middle of a Women in Tech Leadership and Softskills series with AWS for college students and recent graduates and were delighted with the keen uptake. Register an activity, get some goodies! What would a festival be without some branded merchandise? If you are one of the first 200 to register your Tech Week activity on our website, you will receive a Tech Week goodie pack. Celebrate the contribution of IT professionals for the advancement of all society at this free event. Consisting of a series of talks concerning the impact, influence and needs of IT professionals, as well as the initiatives that help promote IT skills within Europe. We are delighted to welcome André Richier, Principal Administrator, European Commission, and Barry Lowry, Irish Government CIO along with ICS President Mike Hinchey who will all be speaking on the day. A full agenda will be circulated soon.